Lahrbert and Halle need to be adopted as a pair. Halle just loves Lahrbert, giving him head butts and curling up to sleep with him. 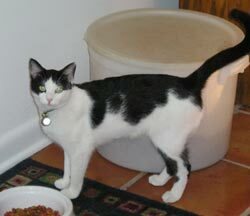 Lahrbert cannot be placed with other male cats as he will fight with them. When he gets with another boy kitty, there is no standoff. He simply launches himself at the other male cat. And yes, he's been neutered. But he loves people, and is SO sweet. He gives kisses and head butts all day long, and what a purr! These great cats should go to a family with some land and away from busy roads. They were born outside, and they LOVE to go out. I've tried to make them indoor cats for their safety, but Halle cries to go out and she just won't stop crying. Both Halle and Lahrbert and spayed and neutered and are up to date on rabies and distemper. 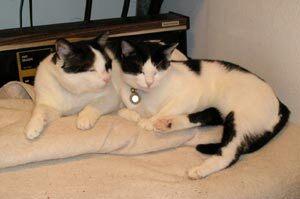 They both tested negative for FIV and leukemia. Both are also very clean, and use the litter box without fail (and cover well, too). Lahrbert has to be confined to a tiny half bathroom when he's not outside as he will tear my 13 yr old boy kitties up if he gets to them. Both of these great kitties came back with me from Islamabad, Pakistan. They were hungry and getting no help from the humans around, so I brought them back. They did not know one another there, as Halle was a small kitten who lived by the American Embassy pool, and Lahrbert was a street cat who hung around the hotel where I stayed. He got in fights nightly with another tomcat, and despite defending his territory successfully each time, had a face full of wounds and scabs for his troubles. He would barely let me stroke his back if I did it carefully while he was eating, and only because he was so starving. He was very jumpy, and whenever a local man would walk past where I was spending time with Lahrbert, he would take off before the person was within 50 ft! 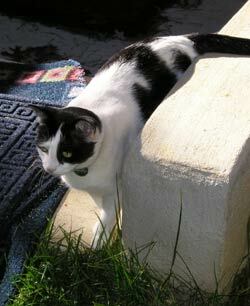 It was obvious to me that this cat had never known kindness, and had likely been mistreated quite often. Because of his scaredy cat nature back then, I named him after the actor who played the Cowardly Lion in the Wizard of Oz, Bert Lahr. Bert Lahr...Lahr, Bert...Lahrbert. Well, it was a very slow and gradual transformation, but this cat is a lover, and loves to be loved! Halle is still very skittish, having had no human contact as a feral kitten when I trapped her. She lets me pet her when she's with Larhbert, and occasionally when she's all comfy in a cat bed and doesn't feel like running away. : ) In other words, she has come a LONG way, and when she does allow her cheek to be scratched, she really leans into it, and what a purr! It's very sad to keep Lahrbert in that little room, and that's why I need to find him a great home fast, because living in a half bathroom is not the life he deserves.